Home siding contractors work in very local markets. Therefore, you can expect that labor costs for your project will mirror those of your metropolitan area. In expensive markets like Boston or Los Angeles, residents understand that the costs for a home improvement job will be higher than they are in Orleans Parrish, Louisiana, where the average single adult earns just 16,847 per year! A survey of home siding contractors in those three areas bears this out. Contractors in all three locations were asked to provide estimates for siding materials and installation to cover a two-story 2,000 square foot bungalo-style home (removal of the old siding was not required). In Boston, labor costs for siding installation averaged $9,760 and ranged from $6,000 to $12,000. In Los Angeles, labor charges varied from $3,000 to $30,000, averaging $9,985. And in New Orleans, labor estimates ranged from $2,115 to $9,000, averaging only $5,064! One reason that siding installation costs vary so much is that within each type there are grades of finish that require more work than others--pre-finished products that don't need sanding, staining, or painting keep labor costs down but then materials are more expensive. That is how you get a $3,000 installation quote in pricy Los Angeles--the contractor stipulated that the material would be a high-grade pre-finished and pre-trimmed brand. The cost of the materials in that case is higher than average. In parts of the country where labor is cheap, it may make sense to buy materials that require more finish work; in more expensive towns it may be be smarter to buy "turnkey" products and keep your labor costs down. When comparing installation quotes from siding contractors, make sure that the siding estimates contain all the same materials, services, and measurements. Trimming, crown moldings and corner boards may be included in one quote and not another. If measurements vary substantially, consider the reasons that might account for the difference; perhaps one contractor allows for more material overage. What then would account for regional disparities? Shouldn't the same prefabricated siding produced in the same factory cost the same regardless of where it ends up? It should, and it probably does. A University of Massachusetts study found that siding preferences are highly regional and you will find marked partiality for specific types from state to state, town to town, and even neighborhood to neighborhood. It seems reasonable then that there would be similar regional preferences in siding grade or features. The study also found that one of the most important criterion for homeowners selecting siding is that it match or "go with'' the house. So you would expect to see high-grade expensive materials in expensive areas and lower-grade choices in less expensive areas. It makes little sense to slap cheap aluminum siding on a mansion or construct an elaborate brick facade on a small tract home. What your neighbors pay for siding, then, can significantly influence what you pay. 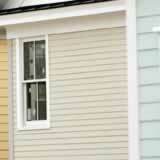 Your siding choices are guided by the preferences of the residents in your state, town, and neighborhood.